Contains Watchmen spoilers, also this won't make much sense if you're not already familiar with the comic book. For present purposes, let's consider Silk Spectre, Nite Owl, and The Comedian as civilians, non-archetypes. They're guided by commonsense morality & aren't plagued by the trilemma reified in Veidt, Rorschach, and Dr. Manhattan. Veidt just got what he wanted, what he's been striving towards for years. Most importantly, he's gotten the thing that he considers morally best – a pulling back from the brink of nuclear destruction, world peace, global coordination on a scale never before realized. Of course, Veidt achieved this at great cost. Now, in the afterglow of achievement, he seeks reassurance that it was a good project after all. Veidt respects few people outside himself, "the smartest man in the world." 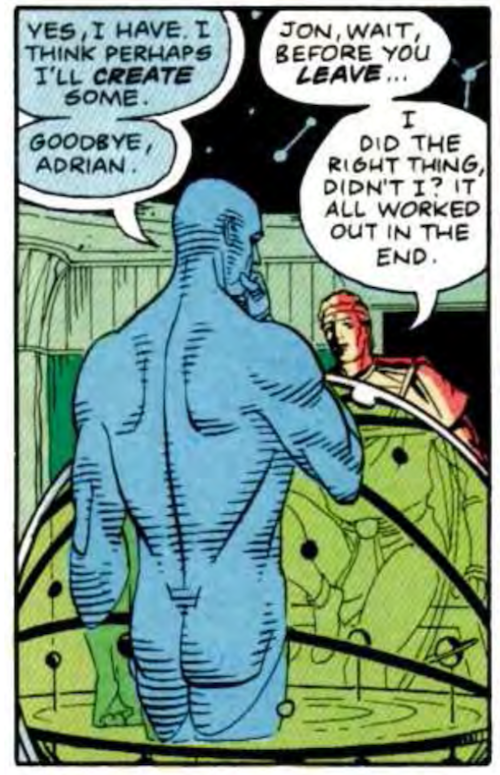 Perhaps the only other person he respects is Dr. Manhattan, who's become something mysterious & powerful, a being not bound by the constraints of time or physics. 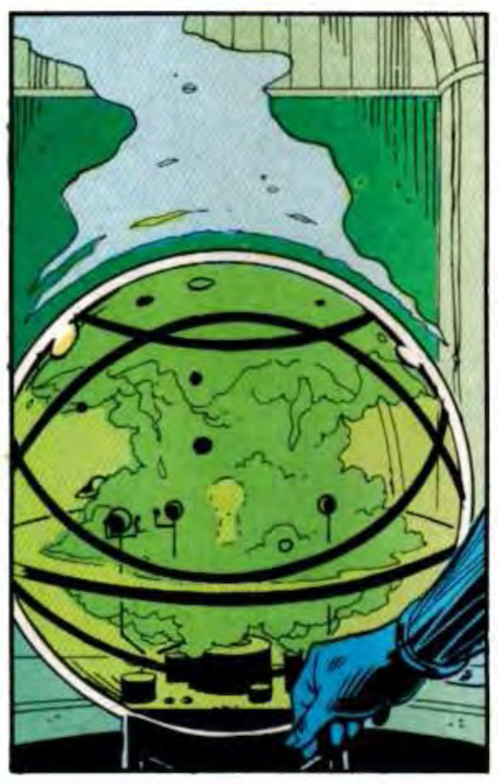 These are my favorite four panels of Watchmen. I like them because they boil an important philosophical issue down to a few straightforward sentences. The issue is this: faced with a world in peril, full of suffering & the potential of far greater suffering looming close, what do you do? The first question is whether or not to make it your business. Silk Spectre, Nite Owl, and The Comedian don't really make it their business – in the end they tap out (The Comedian retreating into drink & reminiscence; Silk Spectre & Nite Owl trying to carve out a life together as normal folks in a messed-up world). Rorschach, Veidt, and Dr. Manhattan make it their business. Rorschach driven by his idealism, Veidt by his ego, Manhattan by forces no one understands. And in making their business, they encounter the second question: if you want to help a world in peril, what do you do? In Watchmen, at least, there are three possible replies. Veidt, the Philosopher-King, makes the world's problems his problems. He arrives at a diagnosis, comes up with a coherent plan of action, and summons the will to execute it. Because Veidt is the archetypal Philosopher-King, this all comes together perfectly. He's clear-eyed enough to arrive at a correct diagnosis, smart enough to draft a masterplan to fix things, willful enough to follow the plan through despite its ugliness. And because Veidt is the archetypal Philosopher-King, it works! The world is saved! It's unclear if Veidt did what he did for the greater good, or as part of his ego trip. Probably a bit of both. Rorschach represents an alternative to Veidt. He's an Antiphilosopher, something that can only exist in opposition to a Philosopher-King. Rorschach is intelligent & resourceful, but can only apply himself against things he finds evil (the mysterious murderer of superheroes, the prison-gang boss, Veidt). He has no constructive project, no plan about where things should head. Without something to combat, Rorschach would cease to exist. The Antiphilosopher's limitations are the easiest to see. Rorschach is myopic, he can't accept that Veidt's plan was probably for the best, despite its horrendous toll. In the face of such a callous display of cruelty, Rorschach's judgment is final – Veidt is evil, people must know, we must destroy Veidt and everyone like him. Veidt is more complicated than that. But Rorschach can't see it. 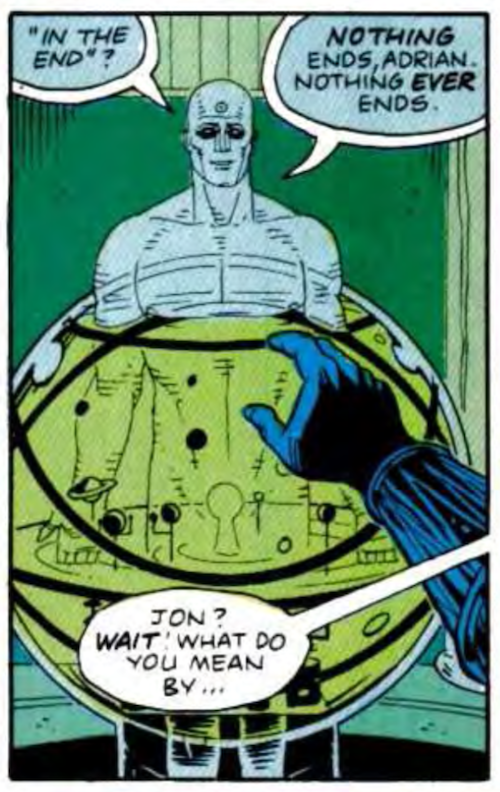 At the climax of Watchmen, Dr. Manhattan mediates the conflict between Rorschach & Veidt. In symbolic terms, the Transcendent occupies a middle position between Philosopher & Antiphilosopher. At first, Manhattan seems to side with Veidt. He kills Rorschach, keeping Veidt's secret plan secret (thus preserving its efficacy). But Dr. Manhattan isn't on Veidt's side. Sure, it's better for Veidt's plan to come off, but not on the grand scale that Veidt was imagining. The Philosopher-King's plan had become his life, his whole identity wrapped up in it. Who is he, if not the savior of the world? From the transcendent point of view, the world can't be saved. Matter will continue to combine & break apart, creating new forms & destroying them. If humanity were wiped out by nuclear holocaust, things would still keep happening. Matter can't be destroyed. This is a scary point of view. It's cold, detached, inhuman. Yet it's probably the most clear-seeing of the three. 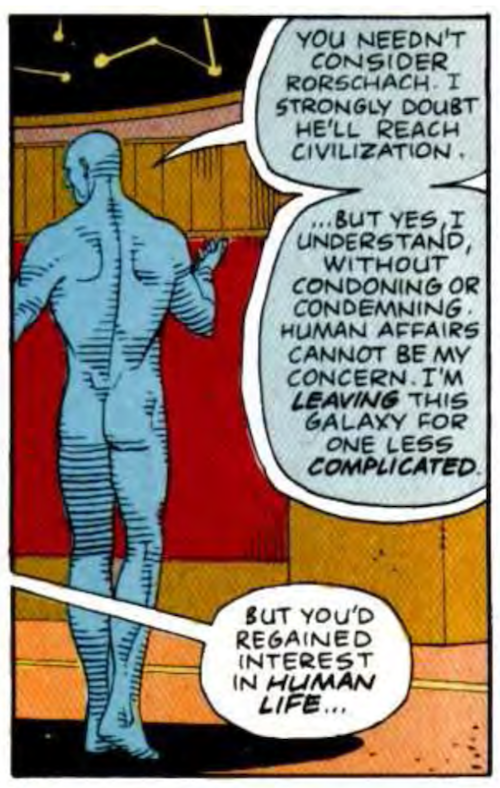 Dr. Manhattan didn't murder millions of people, in service of the greater good, or of his ego. In the end, his stance is neutral – perhaps disappointingly so. But given what heroism looks like, perhaps it's the best we can hope for.